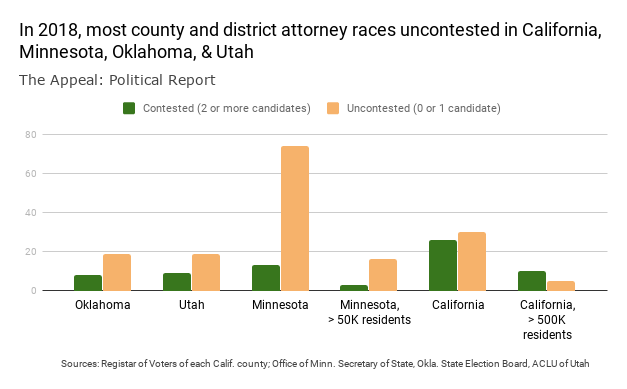 This newsletter highlights the stakes of under-the-radar elections, but one obstacle to championing criminal justice reform in the electoral arena is the large share of local elections that go uncontested. Today, I’ll take a deeper dive into the scope of that phenomenon, and you will also see how frequently prosecutors facing challenges now have evaded competition in the past. Oklahoma is hosting 27 races for district attorney this year, but 19 of them drew just one candidate. Similarly, Utah is hosting 28 races for county attorney, 19 of which feature no competition on the ballot. Besides the 16 Utah incumbents who are unopposed in both the primary and the general election (one did face challengers at the county convention), there are three small counties with no candidate at all. Only six of Utah’s 28 races featured competition in the June 26 primary; only five will feature multiple candidates on November’s ballot. The landscape is even more uncompetitive in Minnesota, which is electing 87 county attorneys this year: 74 of these races (85 percent) feature only one candidate. The share of contested races remains very low in Minnesota’s most populous counties: Just three of the 19 counties with more than 50,000 residents (Hennepin, Ramsey, and Olmsted) feature more than one candidate. Even then, only one of Ramsey County’s two contenders is running an active enough campaign to have a website at the moment. In Hennepin and Olmsted, longtime incumbents Michael Freeman and Mark Ostrem face challenges on the November ballot, but neither has faced a challenger since 2006; both ran for re-election unopposed in 2010 and 2014. California posts a higher rate of contested DA elections. But here, too, a majority of this year’s elections—30 of 56, about the same ratio as four years ago—feature only one candidate. The pattern looks different in California’s largest counties: 10 of the 15 elections in counties with more than 500,000 residents drew multiple candidates. Most of these ended in June’s all-party primary because a candidate got a majority of the vote; only two elections remain contested in November, where turnout will be considerably higher. This is unfortunate in that most of California’s contested district attorney elections are decided by a smaller electorate than could be the case. (In 2014, participation in the primary was 59 percent of November’s.) California could look toward Minnesota for a way to alleviate this: Minnesota waits until November to hold a vote for county attorney if only two people have filed, rather than resolve it in a lower-turnout summer election. Aisha Braveboy, Michael Dougherty, and Marilyn Mosby won the Democratic primaries for State’s Attorney of Prince George’s County, Maryland, for District Attorney of Boulder County, Colorado, and for State’s Attorney of Baltimore City, Maryland, respectively. None will face a GOP opponent in November. They made varying degrees of reform commitments during their campaigns, the details of which you can read about in my analysis from the inaugural newsletter two weeks ago. Bill Elder won the GOP primary for a new term as Sheriff of El Paso County, Colorado. The ACLU has sued Elder for unlawful immigration detentions and reports have documented alarming conditions in the county jail, but his opponent attacked him for being too lax and promised to cooperate with ICE more closely. In this traditionally Republican-voting county, Elder next faces Democrat Grace Sweeney-Maurer. Alexandria Ocasio-Cortez had a victory heard around the country, becoming the Democratic nominee in New York’s 14th Congressional District, which encompasses parts of the Bronx and Queens. Ocasio-Cortez, who is heavily favored to win the general election, has highlighted her proposals to abolish ICE and scale back mass incarceration. She published an essay on the “urgency of criminal justice reform,” tying it to her Catholic faith and forgiveness, on the day after her primary win. In New York’s 11th Congressional District, U.S. Representative Dan Donovan won the GOP primary with unexpected ease. Donovan is the former district attorney who in 2014 triggered widespread protests when he wrapped up his investigation into Eric Garner’s death without bringing any indictment against the police officer accused of killing him. Donovan now faces a potentially competitive general election against Democrat Max Rose, a former employee of the Brooklyn district attorney’s office whose candidacy was recently profiled in the New York Times. Rose coauthored an op-ed in Forbes last year tying his experiences in the military to his interest in criminal justice reform; the op-ed denounces the “staggering” scope of mass incarceration and obstacles to re-entry and lays out some policy proposals. The Democratic primary for attorney general of Colorado put state Representative Joe Salazar against Phil Weiser, a law professor at the University of Colorado. Both articulated a series of reform-oriented positions: support for the state’s marijuana legalization and bail reform, opposition to the death penalty, and a commitment to offering legal support to sanctuary cities. While he is opposed to capital punishment, Weiser (unlike Salazar) said that he would defend the state’s existing death penalty laws—which provide for it—in court. In addition, Salazar ran on pursuing more aggressively reform actions, such as suing localities that cooperate with ICE and suing cities for violating the rights of homeless people. The better-funded Weiser secured the nomination in the June 26 primary, beating Salazar by less than one percentage point. In a general election that is likely to be competitive, Weiser will face Republican George Brauchler, the district attorney of Colorado’s Arapahoe, Douglass, Elbert, and Lincoln counties. In a statement in March, the ACLU of Colorado highlighted Brauchler’s “devotion” to capital punishment. “Brauchler and his office reside at the extreme fringe of the issue in Colorado,” it said, noting that “Colorado’s death row is occupied exclusively by black men from Brauchler’s district.” The ACLU’s statement was occasioned by the jailing for contempt of Greta Lindecrantz, a woman who was refusing to testify in a death penalty case on religious grounds. In another confrontation, Brauchler has mounted a legal battle with the Colorado Independent, a publication that sought to unseal records about prosecutorial misconduct in the case of a person on death row. Brauchler is also blocking efforts to revisit juvenile sentences in the wake of the U.S. Supreme Court decision that struck down mandatory sentences of life without parole for juveniles. In April, he filed a petition that challenged the constitutionality of a new state law that provided for reconsideration of such sentences, which has since led to legal confrontations with the attorneys of Curtis Brooks, one of the individuals looking for such reconsideration in Brauchler’s district. Brauchler provides a good illustration of the impact of uncontested district attorney elections. In 2012, he won his first general election by four percentage points, helped by his party’s performance in the presidential election; by my calculation, Mitt Romney won this judicial district by six percentage points. Four years later, Democrats improved in this judicial district, with Hillary Clinton narrowly edging out Donald Trump—but this time Brauchler faced no opponent. After running unopposed in his past two re-election bids, Berkshire County District Attorney David Capeless maneuvered this year to give a leg up to his preferred successor. Eoin Higgins reports in The Appeal on the coordination between Capeless and the office of Governor Charlie Baker: After Capeless resigned in March, Baker appointed First Assistant District Attorney Paul Caccaviello as the new district attorney. As a result, Caccaviello is able to run as the incumbent this fall, an enviable advantage. In the Democratic primary, he faces defense attorneys Andrea Harrington and Judith Knight. Harrington talked to The Appeal about her interest in restorative justice and in the policies implemented by Philadelphia District Attorney Larry Krasner. You can read The Appeal’s full article here; you can also read here about some of its fallout. Jenkins is running as an advocate for reforming the criminal justice system, which he says “destroys people’s lives, then doesn’t give them the tools or support they need to put them back together.” In his first candidate interview with the Pittsburgh Post-Gazette, he talked of the need for changes that curb incarceration. “In essence, the rich and guilty go free, and the poor and innocent go to jail,” he said in reference to the use of cash bail, which keeps people incarcerated before trial if they are unable to pay. Jenkins also faulted the practice of overcharging defendants as a bargaining tool. The election takes place in May 2019. Last week, Rhode Island’s Democratic Party endorsed primary challengers to three Democratic lawmakers: state Senator Jeanine Calkin (Warwick), state Representative Marcia Ranglin-Vassell (Providence), and state Representative Moira Walsh (Providence). The story gained national attention because the candidate that the Democratic Party originally endorsed against Walsh supported President Trump and has a history of anti-immigrant comments. Facing a furor, the state party later rescinded its endorsement of Walsh’s challenger, though not its endorsements of Ranglin-Vassell and Calkin. All three face primaries on September 12. Walsh attributed the party’s hostility toward her to her progressive stances. As an example, she evoked her opposition to Kristen’s Law, which Democratic Governor Gina Raimondo signed into law on June 29. A response to the opioid epidemic, this measure creates a new penalty of up to life in prison for people who sell a controlled substance that leads to a fatal overdose. Like Walsh, the two other targeted incumbents also voted against Kristen’s Law when it overwhelmingly passed the General Assembly in June. Thanks for reading. We’ll see you in two weeks!